Autocomplete for Tesco.com – The extension pulls the products that are important to you and auto suggests them based on what you have typed and their priorities. The importance of the products is calculated based on a number of metrics so it will get more accurate over time. 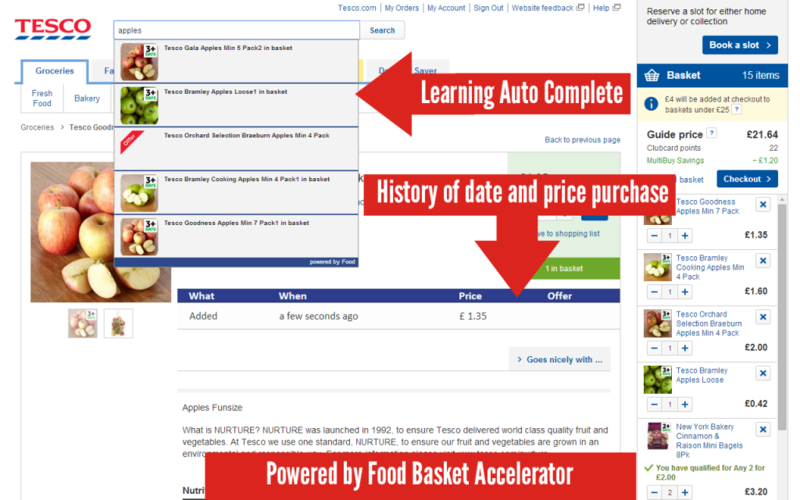 Product purchase history for Tesco Groceries – When you have previously added a product to your basket you will then see it within the tesco.com website product details page. It shows you how long ago you purchased it, how much and what promotions were running. In short it gives you a better experience and more informed decision into making a purchase. All of the data that is compiled by this app remains on your own machine. It is not recorded on a server anywhere and it’s primary and sole purpose is to help you with your Tesco Online shopping. This entry was posted in Chrome plugin, General, Software by Will Powell. Bookmark the permalink.